Crossrail – from its early beginnings - Crossrail . For information about the Elizabeth line please visit the Transport for London website. In many ways Crossrail is not a new idea. In the nineteenth century the Regents Canal Company, realising the important role railways were increasingly playing in London, began plans for a new surface railway across the Capital. Renaming themselves the “Regents Canal & Railway Company” they lobbied for permission to build a railway that would link Paddington with London’s docks, running alongside or even replacing the Regents Canal itself. Parliament eventually granted permission for the scheme in the 1880s, but although work continued over subsequent years to develop the route (which included adding plans for stations in the City of London) it ultimately came to nothing. The idea resurfaced over fifty years later in 1943. With an end to the Second World War finally in sight, the thoughts of many started to turn to what would happen next. This was particularly true in London, which had – and continued – to suffer greatly from bombing. One of the results of this period of contemplation was the Abercrombie Plan. Today, the Plan is mostly remembered for big ideas such as the “Green Belt” and building “New Towns” at places such as Stevenage in Hertfordshire for displaced Londoners. What is less well known is that it also argued once again that better links were needed between the east and west of the Capital, and proposed building two new Tube lines to do the job. Although much of the Abercrombie Plan ultimately came to pass the new Tube lines did not, and although further thought on the proposed lines took place, ultimately post-war London - and indeed Britain - had more important social and economic issues to deal with. The 1974 London Rail Study is where Crossrail, at least as we know it today, was arguably born. A northern tunnel would join British Rail's Western Region lines west of Paddington to the Eastern Region lines east of Bethnal Green. There would be new stations at Paddington, Marble Arch, Bond Street, Leicester Square, Holborn and Liverpool Street. A southern tunnel would connect the Southern Region's Central Division services via stations at Victoria, Piccadilly, Leicester Square, Blackfriars, Monument and London Bridge. Crucially though, the study was almost certainly the first time that it was acknowledged that Crossrail needed to be more than just another Tube line. For London – and areas beyond - to get the most benefit from the scheme it needed to be a mainline railway that just happened to spend a good deal of time underground. Unfortunately, the Study estimated the cost of such a scheme at £300m, and thus although it recommended feasibility studies be undertaken as a priority, it could do little more. Crossrail was, however, now more than just an idea – it was a scheme just waiting for its time. Indeed in 1980 that time almost came – and London almost ended up with a Crossrail that looked very different to that which is being built today. A British Rail discussion paper, published that year, proposed an Inter City link across London featuring three route options and costed at £330m. Rather than focusing on the east and west, the scheme suggested linking the existing infrastructure north and south of London, possibly via a deep bore tunnel beneath the centre of the Capital. Although the route was very different from that which had been proposed in 1974, the overall objective was not massively dissimilar - to create a mainline gauge route that would link different British Rail areas and run a variety of through and direct services. Indeed many of the external factors British Rail thought the scheme might need to interface with also look familiar today, all of which had featured in the 1974 Study as well. A then-prospective Channel Tunnel link gained a mention, with this Cross-London scheme seen as potentially opening up options for a Channel Tunnel connection to arrive into London at Victoria. The need for a potential connection through to Heathrow Airport was also discussed. British Rail also suggested that this scheme might relieve future congestion on the Underground, something that is still very much an objective of Crossrail today. Although the 1980 discussion paper ultimately led to nothing, the looming threat of Underground congestion that both it and the 1974 study had highlighted continued to develop. By the late 1980s, it had become clear that existing Tube and rail capacity was approaching its limits. The Government therefore commissioned and published the Central London Rail Study in 1989 - a report which took many of the schemes highlighted in the 1974 study and developed them into more concrete schemes: East-West Crossrail, a line from Wimbledon to Hackney via Chelsea (now safeguarded as Crossrail 2) and Thameslink. In addition to all this, the Jubilee line Extension was proposed in the East London Rail Study published a few months later. In October 1990 the Government finally gave the go-ahead to British Rail and London Transport to develop the east-west Crossrail scheme. In November 1991, a private bill was submitted to Parliament. The cost of the Crossrail scheme was given as just over £2bn at 1993 prices. Hopes that the scheme would proceed were high, as were the potential benefits, but the nature of the works required meant that it was far from cheap. Indeed although Paul Channon, then Secretary of State for Transport, had welcomed the conclusions of the 1989 Study, he had warned that further work would be needed to establish financing. Reflecting the belief of the Conservative Government of the time, he stated that if there was to be new investment in transport in London, the cost would need to be born by the passengers who would benefit through the fares they paid, and through contributions from property developers who would gain from the improved infrastructure. Unfortunately, the onset of the recession in the early 1990s hit both these groups hard and this, combined with the increased constraints on public finances, proved key factors that lead to Parliament rejecting the Bill in May 1994. It was widely agreed, subsequently, that postponing the project at that time was a mistake. Crossrail was precisely the type of project which would have begun to promote long term economic growth in an otherwise challenging economic climate. Luckily, however, there was still hope for the future. Despite the decision not to proceed, the October 1990 announcement had at least safeguarded Crossrail’s route, ensuring that future land development would not prevent the scheme from going ahead. Soon members of the Government, with the support of the opposition Labour Party and members of the business community began to explore means of putting the scheme back on the agenda. In July 1994 it was announced that the Crossrail project would be pushed forward under the Transport and Works Act (TWA) system, which had replaced private bills as the procedure by which large infrastructure projects could be brought about. Before the draft Order was lodged, however, the Government commissioned a further study to determine whether any smaller scale alternatives could achieve the same benefits as Crossrail. Its conclusions were clear - there were no cheap alternatives to Crossrail. The costs always exceeded their benefits. At the same time, a team of officials from various Government departments and rail organisations reassessed the economic case for Crossrail. Their conclusions further reinforced the potential benefits. They also reached an additional important conclusion - it simply wasn’t practical for the project to be wholly financed by the private sector. The Government made no formal comments on the findings of either report. Indeed in April 1996 Sir George Young, the Secretary of State for Transport, asked London Transport and British Rail – the joint promoters of the scheme – to temporarily suspend their TWA application. Crossrail, he stated, could only come about after the Jubilee Line Extension, Thameslink and the Channel Tunnel Rail Link had been dealt with. Behind the scenes, however, momentum was now building. A small team within London Underground continued to manage the safeguarding, and worked with developers to ensure the project could proceed if it was resurrected. It was effort well spent, for in July 2000 the Labour Government’s ten year transport plan, Transport 2010, once again asserted that an east-west rail link should go ahead. The Mayor's Transport Strategy also prioritised the relief of overcrowding on London Underground. The Government also asked the Strategic Rail Authority (SRA) to study the requirements for extra passenger capacity to and through London. The London East West Study that the SRA published recommended that both Crossrail and the Hackney to southwest London routes be resurrected and schemes developed to construct them. 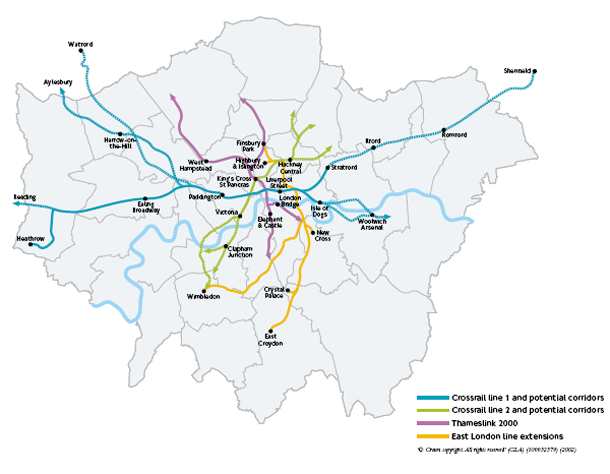 The London East-West Study was well-received by Government and as a result Cross London Rail Links Ltd (CLRL), jointly owned by the SRA and Transport for London (TfL), was set up to undertake project definition work on a Crossrail link and a feasibility study of a possible Hackney-southwest London scheme. CLRL's initial budget was set at £154 million and the company was launched in January 2002. The resulting Crossrail Business Case was presented to the then Secretary of State for Transport, Alistair Darling, in July 2003. He announced that the Government supported the principle of a new east-west Crossrail link, but wanted to be assured that CLRL's proposal was deliverable and financeable. He appointed a review team, led by Adrian Montague, to assess this. At this time the scheme was expected to cost in the region of £10bn. Alistair Darling also asked CLRL to consult on the Crossrail proposals, and a consultation round was held between September and December 2003, based on a scheme serving Heathrow and Kingston in the west and Shenfield and Ebbsfleet in the east through new tunnels under central London. A second consultation round was held between August and October 2004. This presented the updated proposals including service to Maidenhead but without the Kingston branch. The 2004 Spending Review provided no direct funding for the scheme. The Government, however, did commit to introducing legislation to enable Crossrail to proceed, and undertook to work closely with TfL and wider stakeholders to develop a funding and financing package. Crossrail was now further along the path to reality than it had ever been before. It seemed no longer to be a question of whether the scheme might proceed at all, but more a case of finding the best route that provided the best value for both London and the UK. The Crossrail Hybrid Bill was presented to Parliament in February 2005 and the principle of the scheme was established at the second reading debate in July. The Bill was then scrutinised by committees in both Houses of Parliament where affected parties could appear as petitioners to have their objections heard. It was a long process, but ultimately worthwhile – with some changes the Bill finally received Royal Assent in July 2008. The Crossrail Act 2008 finally gave Crossrail a confirmed route - Maidenhead and Heathrow in the west to Shenfield and Abbey Wood in the east, with new rail tunnels (and stations) under central London as required. The funding deal for the scheme was complex (the full details of which can be found here) but the basic principle was simple – the cost would be shared between the Government, TfL and the business community. After 35 years of planning and development, Crossrail finally broke ground on 15 May 2009 at Canary Wharf, when the Mayor and the then Transport Secretary Lord Adonis launched the first pile into the North Dock in Docklands at the site of the new Canary Wharf station. Crossrail has seen some further changes since then. In 2010, the Government’s Comprehensive Spending Review confirmed savings of over £1bn in projected costs due chiefly to a revision of the tunnelling strategy. This meant that Crossrail services would now commence through the central section in 2018 rather than 2017, followed by a phased introduction of services across the rest of the route, but it also allowed the funding envelope needed to deliver Crossrail to be revised to £14.8bn from £15.9bn. Nearly forty-years after the Crossrail scheme was proposed, tunnelling began on the project when Phyllis, the first of Crossrail’s eight tunnel boring machines, set out on her journey from Royal Oak Portal towards Farringdon. In doing so they follow a route that the men and women who put together the East West Study, the 1989 Central London Rail Study, the 1974 London Rail Study, the Abercrombie Plan and even the nineteenth century Regents Canal & Dock Railway plans would all have recognised. As they carved through the clay beneath the Capital, Crossrail’s tunnel boring machines carried with them a rich history but also hold a great deal of promise, heralding the benefits to both passengers and businesses that will begin with the opening of Crossrail’s central section in 2018. Crossrail’s tunnelling marathon under London is now complete. Crossrail tunnelling began in May 2012 and ended at Farringdon with the arrival of tunnelling machine Victoria. The Transport for London (TfL) run railway will be named the Elizabeth line when services through central London commence.